- Sizes available: 100 ml, 200 ml, 500 ml, 1 ltr & 5 ltr . 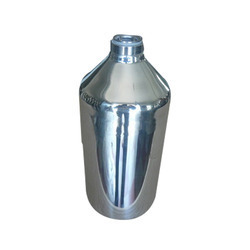 We are engaged in offering a wide range of Thermos Steel Bottle, which is suitable to store hot or cold liquid. The liquids stored in these bottles remain warm for a longer duration of time. We offer these bottles in 350 ml and 500 ml. Our range of Thermos Steel Bottle comes with strong handle which provides firm grip.